Welcome to Hotel Lugana Parco Al Lago Sirmione. An enchanted and enchanting landscape, the high mountains, the blue sky, and the water bringing them together in a reflection; a lucid air, full of suggestions, and the green of trees, cluster pines and palm trees, cluster pines and palm trees, the red bougainvillaea and the orange fruit of clear Mediterranean origin. A sweeping view, to enwrap you in a relaxing embrace warmed by the sun. The feeling to be at the centre of a circle is enhanced by the special character of the place; a mix of close and far away sensations brings us to stop in a place where hospitality is everything. A park with sequoias and magnolias tells us where we are, the lake before us comes to meet us with no hindrance, granting peace and tranquillity. A place of spas and health care, it sees lots of attention, care and dedication in the house. Simple things for those who love the land and feel the strong connection with its products. One of them, wine, is present in the air, with its smells and the sight of well groomed vineyards. On the table, the rest of the territory meets with the creativity and research of men who have been able to create flavours and scents and mix them with the emotions of an unforgettable stay. In the warm evening breeze, you can enjoy a romantic candle lit dinner on the veranda, waiting for the blue to turn red at sunset, and give way to the silvery moon. Our family will be happy to be your host and grant you these emotions by welcoming you to our house of 17 flats, with the convenience of a car park inside and the comfort of swimming pool and private mooring facilities, taking care of your every need and, why not, spoiling you a bit. Passion and history bind us to a land where, with loving care, we grow the vines from which, with lots of dedication, we obtain our wines at the Ca' dei Frati farm, a place we own, and a centre of special attentions and intense emotions, too. 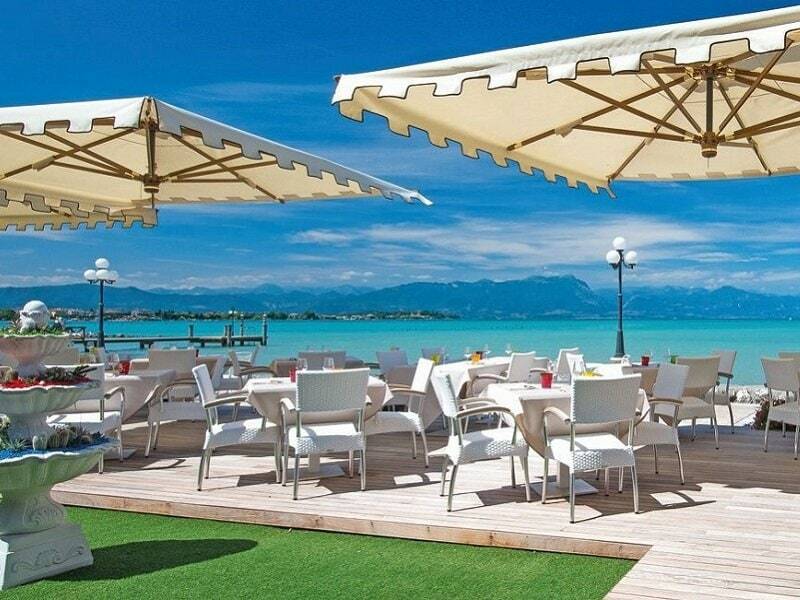 (Hotel Lugana Parco al Lago Sirmione hotels).